These are really fun to do - as I've said before clients rarely give you open slather to this to a face - other caricaturists enjoy it. 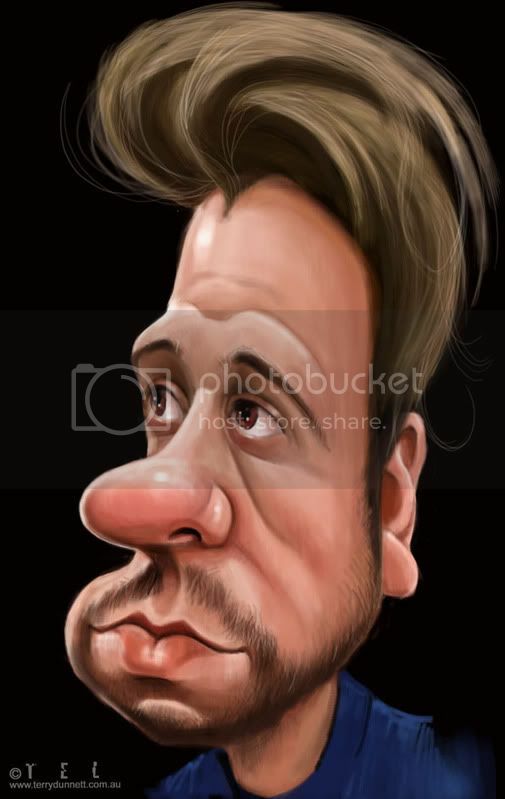 This is Matt Ryder who has a caricature business in exotic Dubai. Cheers Matt. Thanks again Tel, this is awsome ! I'll hold you to that, but until I meet you, the best i can offer is a caricature ! Keep your eyes peeled on the forum. Hope you are going to the Con this year, as a fellow distance traveller !!!! I'll look forward to it Matt - I'll be in Raleigh in November for the Con. Really excited about it - not the journey though - see you there. Good job Tel, hopefully I can make it to Raleigh also, it would be great to meet you. I must revisit Mike Carlon's caricature I spent a lot longer on Matt's - I was going for the Count Igor look but fell way short.